Spring tactics depend entirely on the spring situation, and you’ve noticed as well as I have that conditions vary across as wide a range in spring as in all the other seasons added together. You’ve got to be prepared to ﬁsh anything from a tiny midge or BWO mayﬂy hatch on smooth water to nymphs and streamers deep in water that is blown out. Rather than describe tactics speciﬁc to each condition, I’ll give some examples of problems and solutions in my own ﬁshing from recent springs. The most dramatic came on a scheduled ﬂoat of the Deschutes River with Curt Marr. He has a tighter calendar than mine. When he plans a trip, he’s reluctant to miss it. Rain piled up in the days before our dates; reservoirs got full; and water was released. The day we were to leave, levels were at 9500 cfs, twice what they ought to be for the best Deschutes ﬁshing. I called Curt to see if he might not want to cancel. He said, “Let’s go. At least we’ll have a ﬂoat.” We had a ﬂoat. When we put his raft in at Trout Creek, the water was at the promised height and approached the color of skim milk . . . not quite that white, but more chalky than clear. Things looked pretty hopeless for entertaining any trout. Late in the afternoon of the ﬁrst day on the river, Curt said, “Since we aren’t going to catch any trout, how about showing me how you would rig to ﬁsh nymphs in these kinds of conditions.” I was reluctant, but I did. I rigged a 10-foot leader with a big bubble indicator up top, 6 or 8 feet of leader down to a couple of heavy split shot, a big Salmonﬂy nymph 10 inches below the shot, and a size 16 Lightning Bug on point 8 inches from the larger nymph. We parked the boat in a backchannel behind an island where the current was a bit broken, not nearly as deep as the main current I would ﬁsh in normal conditions . . . had I gotten into that water I’d have instantly been swept away. I made some demonstration casts, lobbing them far upstream to give the heavy outﬁt plenty of time to sink and then mending and tending the line to keep the indicator ﬂoating freely, just as you’d do in more reasonable water. I got the bugs worked out of the presentation; the bobber bounced along, hesitating once in a while to let me know the shot nicked the bottom now and then. Things were going smoothly, in terms of showing Curt what I’d do if I had any hope of catching trout. Of course it was not long before I hung up and prepared to make the part in the demonstration about losing everything and having to re-rig every few minutes. When I tugged at the snag in hopes of freeing whatever had got lodged, whatever it was tugged back and then suddenly shot downstream. You know the rest of the story. It turned out the trout had done the same thing Curt and I did: They found a soft spot in the current, on the backside of an island, to idle away their time until the water became more reasonable out where they’d rather be. That ﬁrst animated snag turned out to be the most aggressive trout in a pod of them. We were able to educate half a dozen about the perils of bottom- bounced nymphs before ﬁshing dried up there, and we trotted off downstream. It was a three-day ﬂoat. We camped, suffered heavy rain, didn’t get to see the water subside even an inch, clear up even a bit, but were able to ﬁnd three or four isolated pods of trout each day. We took several trout from each pod before moving on. It became far more of a challenge to read the water right and ﬁnd the trout than it did to rig right and catch the trout. They were in the kinds of places that wouldn’t be places when the water was normal. Every one of these holding areas was deﬁned by something that broke the current, whether it was the point of an island deﬂecting it outward, the bouldered bottom of a rifﬂe causing hidden soft spots, or the root wad of a tree that would in normal circumstances have been safely up on shore. Wherever the current hesitated, we found a few trout. A perfect description of the most common holding lies, in that high water, would be the kinds of side rifﬂes that would normally be just a foot deep, too shallow to hold trout, and that you’d pass by on a normal ﬂoat. Perhaps you’ve noticed those tiny rippled spots, always on the inside bends in the river, and like me, you’ve likely tried ﬁshing a few of them in your past and always found them ﬁshless. They always look good, but trout are usually busy holding in water that offers them more protection from osprey and otter . . . and us. But when the water is high and off-color, trout don’t need that protection. What they need is shelter from the brisk currents. They ﬁnd it in all those spots that would not be spots if the water was lower. Jim Schollmeyer and I stopped at the Owyhee River in Oregon last spring on our way to the Bighorn in Montana. The water was a bit high and slightly off-color when we got there. A constant supply of rain while we were there did not serve to cause the water to drop and clear, which is what we wanted it to do. We hoped to ﬁsh hatches of midges and BWOs, with those big browns, for which the river is so famous, tipping up to sip them. We got none of that. But we were able to get fair ﬁshing simply by rigging with ﬂoating lines, 6- to 8-foot leaders, and streamers with some lead in their bellies. The water was extremely difﬁcult to read because the river’s ﬂows are tamed by the dam upstream, and when it’s opaque, you can’t see into it to reveal the contours of its bottom. A shallow ﬂat doesn’t look much different from a submerged rifﬂe; the current levels them both out. Boulder-garden runs stood out because you could see where the landscape alongside some runs tumbled boulders right into them, and you could also see the few boulders that protruded and slight boils sent up by others that were too deep to stick out. These places held trout, and we were able to take a few from them, but they were also leg-breakers because it was impossible to see where to wade safely. Most of our ﬁshing was done by simply exploring with big streamers. We’d insert ourselves at the head of a long run of what looked like promising water, then cast long against the far bank, let those streamers sink, retrieve them back in ﬁts and starts. Our project was to swim them through the places where the water dropped off, became suddenly deep, formed invisible lies for nice trout. It was reading water for soft spots, the same as Curt and I had done it on the Deschutes, only we didn’t read the water with our eyes; we read it with our streamers. They found the deep spots for us. In turn, the deep spots provided a few trout for us. It was interesting ﬁshing until a monstrous thunderstorm blew us off the river. Rain landed in buckets, scathed the landscape, tumbled rocks off the steep hillsides, sent even ducks looking for shelter and quacking in protest. It soured our attitude and ended our ﬁshing. We didn’t stick around to see if the water came up and went even further off-color. We got out of there, and it’s likely that you came about the time we left, arrived in sunshine, got to ﬁsh water that became low and clear, were able to present your dry ﬂies to trout rising to sip those midges and BWOs. Our destination was the Bighorn River, where we set up Jim’s trailer at Cottonwood Camp. The weather there was closer to bitter, on the trailing edge of winter rather than the leading edge of spring. The water was normal, neither high nor off-color. But it was cold, and the hatches we hoped to ﬁsh hadn’t started yet. We ﬂoated every day anyway and got into small pods of trout rising sporadically to scant numbers of a variety of things that trickled off: olives, midge pupae, scattered Early Brown stones, various things the trout tipped up to take but that we were never able to collect and observe. It was slow ﬁshing. I decided to practice some wet-ﬂy swinging techniques I’d learned from Davy Wotton, the wet-ﬂy guru, while ﬁshing with him on the White River in Arkansas. 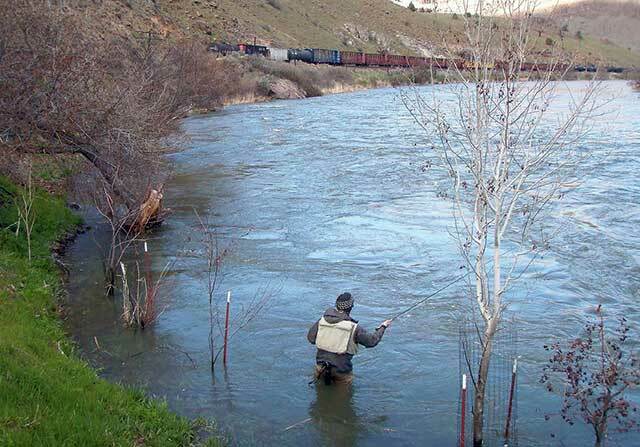 I’d bought an 11-foot rod and supple ﬂoating line in order to outﬁt for his high-rod method. Because rises were so sprinkled that I didn’t feel compelled to cast over them, I sat in the grass at the edge of the river, next to Jim’s boat, and patiently strung that long rod, ﬁxed a 9-foot 5X leader, tied a Pheasant Tail Flashback to the tip, added 3 feet more of 5X, tied a Tungsten Bead Pheasant Tail to it as the point. The great Davy would have rigged with three wet ﬂies in a variety of sizes, sink rates and colors, but I reckoned the trout must be seeing and taking at least a few BWO nymphs and wanted to imitate them for my own pleasure if not theirs. It turned out the trout were quite pleased by this setup. I waded into a broad rifﬂe that faded out into an even broader run, the kind the Bighorn features and that can take an hour or two to ﬁsh if trout are at all active. They were, in far greater numbers than showed on the surface. Just a few of them rose, on sparing occasions, the length of that entire stretch of water. I didn’t bother rushing to them, casting over them. Instead, I entered at the head of the rifﬂe and then worked my way downstream as patiently as I would had I been covering it for summer steelhead or Atlantic salmon. I worked out a long line. The slow rod, with its construction of wide, open loops, didn’t cause me any troubles, in the form of tangles. When that brace of Pheasant Tails landed, always cutting across the currents at just a slight angle down- stream, I’d give them a few feet to sink. Then I would make upstream mends to slow them, to swim them, I hoped, as patiently as BWO mayﬂy nymphs might rise from the bottom in that water that bordered on frigid. Trout didn’t hit with any thuds. Instead, they would intercept the nymphs gently, tug at them with great hesitation, or tap-tap them as you would expect from a steelhead. It was counterproductive to set the hook quickly, even with that long rod that softened any set. Instead, it was best to simply hold on, let the trout hook themselves, not respond at all until they were on and knew it and were angry at that sting, running away from it. The best way to make it all work was exactly the way Davy Wotton taught me on the White River: Loft the rod tip high, let the line drop in a constant curve from the rod top to the water, watch that curve, and set the hook only when the line began to rise higher in the air, indicating a take, or the point where it entered the water hesitated, even moving off a bit upstream or straight away. Then a trout was on and setting the hook would cause it to dance. This method—swinging nymphs and even wet ﬂies that represented the hatches that were trickling off—worked well for about three days. Then the weather warmed, the BWO hatch started to come off in more normal abundance, trout turned their attention to ﬂoating duns, and my swung nymph tactic no longer interested them. That’s all right. My interest turns away from sunk ﬂies when trout begin rising in sufﬁcient numbers that they can be pinpointed and cast to with dry ﬂies and some hope of success. That’s another and more major spring tactic: ﬁshing dry ﬂies and emergers over rising trout. You know how to do it better than I do, though, so I’m not going to bother you about that. I’ve just given you some hints about what to do when what you’d really like to do isn’t working very well in the spring conditions of the moment. 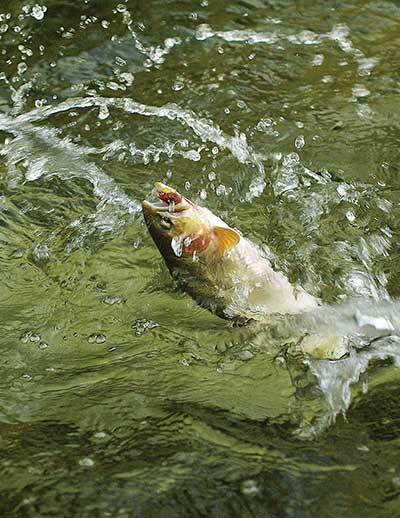 Excerpted from Seasons for Trout by Rick Hafele and Dave Hughes. Buy Seasons for Trout and Tactics for Trout from Stackpole Books.